Shopping around for a new SUV is exciting: There are a lot of state-of-the-art technologies available with powerful engine options to reliably transport your family and gear throughout Jenkintown, Rydal, and Glenside. Our goal at Sussman Kia is to simplify the research process of your car-buying journey, which is why we’ve put together this 2019 Kia Sorento review. By the end of it, you’ll be familiar with the interior specs, engine performance, and safety features available in this midsize SUV. Plus, we’ll let you know where you can learn more. New for 2019, the Kia Sorento comes standard with three rows of seating to carry seven people. Split-fold seating offers an abundance of options for carrying cargo and passengers: The second-row seats have a 40/20/40 split-fold design, while third-row seats have a 50/50 split-fold design. When all the seats are folded down using a handy lever in the rear, you can fit up to 73 cubic feet of cargo inside. Plus, the available Smart Power Liftgate™ makes the Sorento easy to load, even when your hands are full: Simply stand behind the vehicle with your Smart Key, and it’ll open for you. This liftgate option even has a programmable height adjustment, which you can set according to your reach or parking height clearance. The 2019 Kia Sorento features a 185-horsepower 2.4L engine, which can give you an EPA-estimated 22 city/29 highway MPG.1 It’s also equipped with an EcoMinder® Fuel-Efficiency Indicator, which lights up on your dashboard when you’re driving in a fuel-efficient manner. This feature can help you build driving habits that will save money at the pump. Opt for the available 3.3L V6 engine for up to 290 horsepower. This engine is also paired with an 8-speed automatic transmission, which provides nearly seamless changes from gear to gear. Plus, if you’re looking to tow a small RV or recreational boat, this option is for you: It can tow up to 5,000 pounds when properly equipped. Kia has added new driver-assistive features to the Sorento for 2019 to give you more peace of mind when you drive. Available technologies now include Lane Keep Assist and Driver Attention Warning. When you drive a model that’s equipped with DAW, your vehicle’s computer monitors your driving behavior to help sense driver fatigue. Driver-assistive features along with a protective body design have earned the 2019 Sorento high acclaim for its safety precautions. In fact, it received a 5-Star Overall Safety Rating from the National Highway Traffic Safety Administration. The Sorento was also named a 2019 TOP SAFETY PICK+ by the Insurance Institute for Highway Safety. 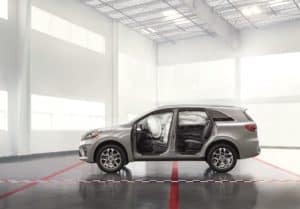 If you’re looking for a vehicle that can easily transport seven people, packs plenty of power to haul your gear, and is equipped with state-of-the-art safety systems, then the 2019 Kia Sorento is a great choice. 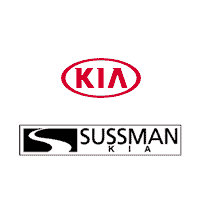 Sussman Kia invites drivers in Jenkintown, Rydal, and Glenside to visit our showroom to see this capable SUV in person—so if any of the above describes you, contact us today to schedule a test drive!